Pocket gophers are burrowing, medium sized rodents that are called “pocket” gophers because they have two fur-lined face pouches (one on each cheek) to hold food. When they bring food back to their burrow, they turn the face pouches inside out to release it. Evidence of these very common pests are easy to spot because of the fan-shaped mounds of soil they push out of their tunnels. They eat a wide variety of leafy plants, particularly those with large fleshy roots, bulbs, tubers, or rhizomes. • Feeding on roots encountered while digging. • Pulling plants into the burrow from below. We have heard many stories from gardeners who have seen whole plants disappear into a hole and experienced the shock of having a big, beautiful plant one day and finding a blank spot the next day where it was supposed to be. There are at least five ways to minimize pocket gopher damage which are readily available at both Payne’s Garden Centers. Trapping with spring traps or box traps. Root Barriers: Remove the soil from an area of garden or flower bed at least 18 inches deep. Line the sides and bottom of the hole with ¼-inch to ½-inch hardware cloth or wire mesh. Replace the soil. Biodegradable Repellent — Caster oil. Derived from the castor bean plant, Ricinus communis this products works because gophers don’t like either the smell nor the taste of castor oil. 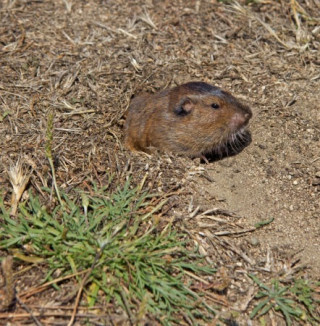 Pocket gophers can grow from five to nearly 14 inches long. They have fine, soft fur ranging from almost black to pale brown to almost white. They have powerful front ends with short necks, large claws, and big cutting teeth (“incisors”) that protrude in front of their lips. They are 100% vegetarian. Underground, pocket gophers close their lips behind their incisors while they are biting, so they do not get dirt in their mouths. 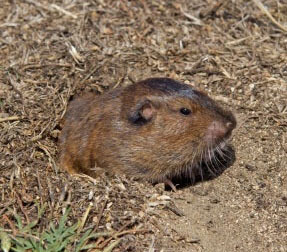 Pocket gophers prefer light, moist, well-composted, well-drained soils. They dislike very heavy clay soils and usually avoid gardens where clay soil is prevalent.